Please note: A meal is to be provided to DJ to all evening bookings regardless of time booked & all daytime bookings over 4 hours. Please see FAQ for more detailed information & explanation why. Please Note: Any ferry, parking, toll or similar fees are billed extra on a separate invoice to the booking. Please Note: We arrive to set up approx 2 hours before your nominated start time (for free). If you require us to set up any more than the 2 hours before your nominated start time then you will need to pay us at the full rate for that time. Example You book us for a start time of 6pm, we would normally arrive at 4pm (approx). If you need us set up by 2 pm for whatever reason then you will need to pay for the 2 hours extra staff time of standing around as we do not travel twice to events. 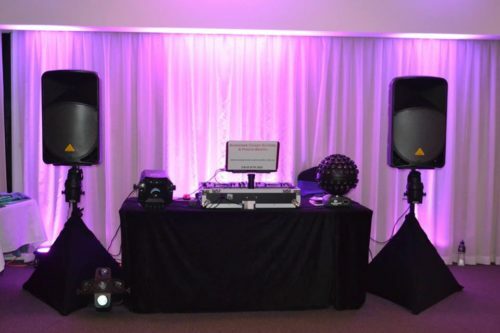 Book DJ & a Photo Booth for your event to make your event even more spectacular. Photo Booths are always the hit of the party. WE have one of the best photo booths available on the Sunshine Coast. Please add us on Facebook to view any last minute available deals from time to time.